As always, the stop that takes a little extra effort is more rewarding. In this case, stopping at Zip Dee was a great choice. 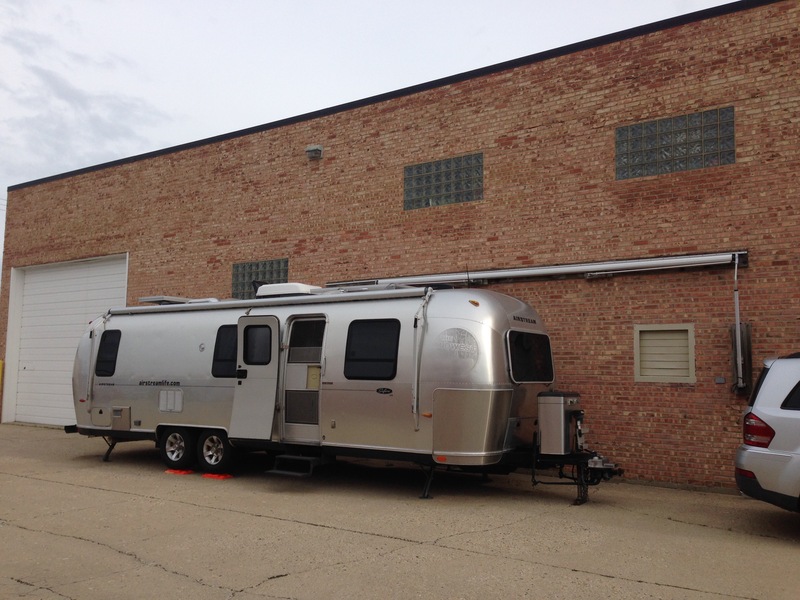 I’ve wanted to visit this facility for years, but never made the detour from our travels and braved the Chicagoland traffic to pull the Airstream up to Elk Grove Village before. The factory is not open to the public, but since we are carrying Zip Dee chairs, bags, and other accessories in the Airstream Life Store, I wanted to get a peek inside to see how it’s all made. These days it’s rare to find a product made in the USA, and the folks at Zip Dee pride themselves on that. I talked to Jim Webb, the president, and he emphasized how even the screws and bolts are made in the US. He said he could tell the difference between a US-made bolt and an imported bolt just by the way the bolt threads catch when starting to insert the bolt. The US ones are smoother and the metal (always stainless steel or aluminum on Zip Dee products,so they never rust) is more consistent. That obsessiveness about the source and quality of materials is everywhere in the building. Most components of the company’s products are hand made. I didn’t see a single robot or other automation in the assembly area. About 30 people currently work there, and most of them are engaged in bending, cutting, drilling, sewing, and packing. There’s a lot of hand labor that goes into building every awning, chair, and every other product they make. I learned something reassuring while talking to Jim. Zip Dee simply won’t make cheap stuff. When pressured by major distributors and retailers to cut the cost (and quality) of products, Jim’s answer is simple: “We aren’t in that business.” Plenty of other companies will make low-cost, lower-quality chairs, awnings, shades, bags, etc., so why play that game? This is a company that takes pride in building something really good—something that will last. Zip Dee has one RV space next to their building for customers who arrive to have awnings installed, so we took that. As urban camping goes it was fine. Not too noisy even with O’Hare only a few miles away. I prefer the occasional sound of a jet to train horns at night. The outdoor GFI outlets in the RV space all kept popping on us so we skipped using the shore power and relied on our battery exclusively. We used a lot of power. It was well into the 80s all day and didn’t cool off much at night so we ran all 3 fans all night, plus we watched a movie using the inverter and charged up laptops. The net results was that our battery was at 29% capacity by morning (down 74.5 amp hours), the lowest we’ve ever gone with this new Lifeline 8D. Solar brought it back up to 51% by 4 pm and I figured that was plenty until I saw the sites at our next stop, the Dunewoods Campground at Indiana Dunes National Lakeshore. Every site deeply shaded and no chance of meaningful solar gain. Oh well, that’s why we have a big battery. We spent the night like tent campers, laughing over a game of cards and ice cream instead of a movie, and saved the power to run the fans again during the humid night. We woke up to 19% capacity, which will be fine if we get a few hours of sunshine while towing down to Indianapolis today. I just wanted to say how much I enjoy “man in the maze”. You have a superb writting style. 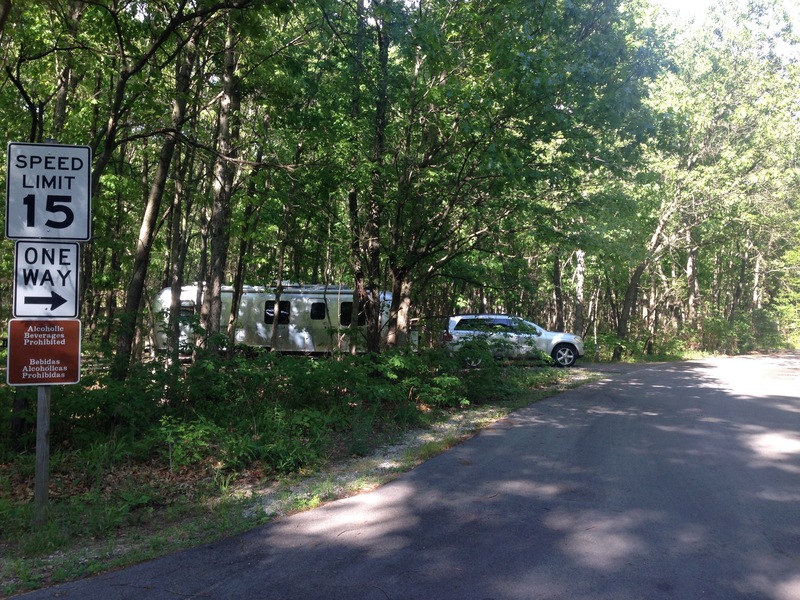 Thanks so much for sharing your Airstream adventures. Enjoyable. I wonder if I have enough skills to pull an Airstream into Chicago traffic? That is an adventure in itself !